Looking for an appetiser to go with your delicious Christmas main course? 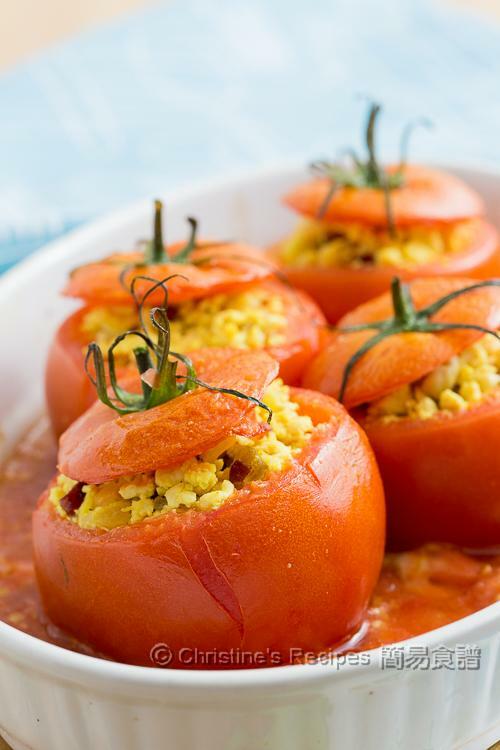 The slightly tangy taste of tomatoes makes this dish so good to be served as an appetiser, or a light meal if you like. What I particularly love is its vibrant red colour that gives me a very pleasant and seasonal feel. The eye-catching lids look like the tomatoes are wearing small hats. The ingredients used are also very simple. Amongst the ingredients, there's a bright yellow powder, called turmeric, used to cook with the chicken, is a kind of healthy spice that can help boost up our immune system. Although there’s a little of challenge to use cutlery to pick up the fillings, this dish is so impeccable and refreshingly tasty. 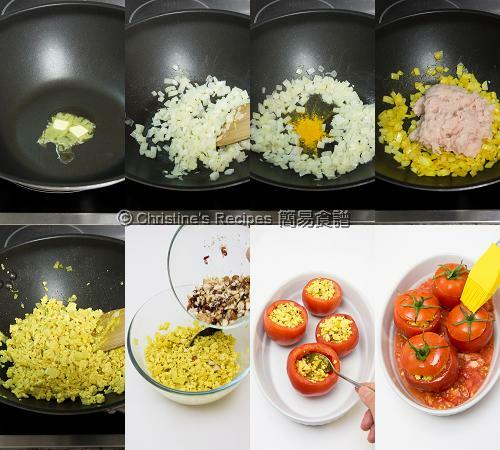 Slice off the top of each tomato as a lid. Use a knife and teaspoon to scoop out the pulp. Roughly chop the pulp and reserve. Discard the seeds if desired. Invert the tomatoes onto a wire rack lined with kitchen papers to drain off any excess moisture. Heat oil in a frying pan over medium heat. Saute the onion until aromatic and translucent. Add garlic and turmeric and cook until fragrant. Stir to combine. Push onion to the sides of the pan. Add some oil in the middle to cook the chicken until cooked through. Use a spatula to help loosen up and break apart the meat while stir frying. Season with salt and pepper. Transfer to a bowl to cool down. Stir in the nuts and dried fruits. 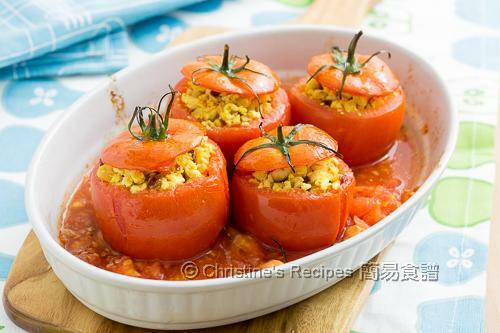 Fill each tomato with the chicken mixture, cover with the lids and place in a baking dish. Pour in the reserved tomato pulp. Brush oil on the tomatoes. Season with salt. Bake in the preheated oven for 20 to 25 minutes. Serve immediately. 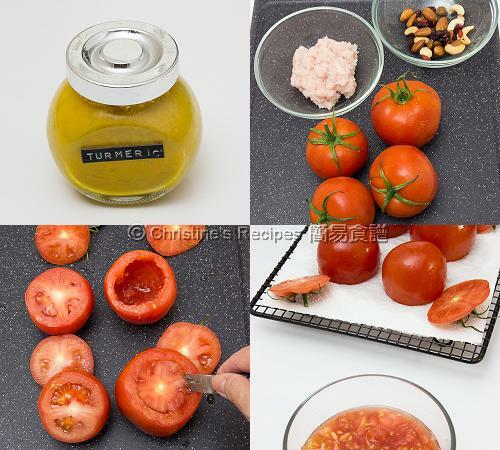 Choose tomatoes with stems intact for better presentation. Tomatoes without stems intact will also work. To enhance the flavour and texture, I used raw cashew nuts, pistachio, almond, dried cranberry, goji and raisins, adding more nutrients as well. You may use any favourite nuts and dried fruits. They look way too beautiful to eat, Christine.